The Tyee recently completed its 6-part series entitled “Native Youth, In Their Own Voices,” which explores many of the shared challenges and dreams of the roughly 75,000 Aboriginal youth in BC. Interviewed over the course of a year, these youth share compelling stories and insights about such topics as school, alcohol and drugs, family, culture and language. Articulate, real, determined: these are voices that need and deserve to be heard more widely. One article on culturally-sensitive approaches to education discusses the success of Aboriginal-oriented alternatives at some high schools. There, staff work to assist youth both in and out of the classroom, helping them locate resources for meeting basic needs like food and shelter, safety, connectedness, and self-esteem. These programs do better by their students because they’re flexible, letting them design their schedules around things like work. 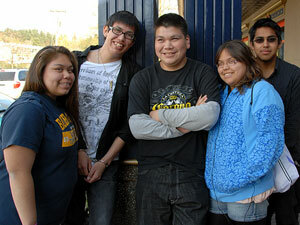 Another piece looked at the impacts of the foster care system on Aboriginal youth. We hear about one young woman who was removed from her home because of parental neglect due to drinking, only to be placed with non-Aboriginal foster parents who also drank excessively. All in all, a series well worth reading.